Robertino Loreti’s history began in Italy a half a century ago. At the age of 14 he won millions of hearts by his voice. His famous hits: «Jamaica», «O Sole mio», «Santa Lucia» – sounded everywhere on the radio, in movies and even in cartoons. Today they say about the singer as about “living legend”, but few people know that he continues to sing. Today Roberto as always is full of energy, he is the same sincere and cheerful, he continues to give warmth of his heart and soul to his admirers in Italy, Norway, China, Finland. He is on stage again, definitely not a boy, but a respectable seignior over 60, but he is still so charming and impressive. His unique and inimitable voice, not children one, over the years, became even more beautiful, like a seasoned cognac. Since 2011 the international project “Robertino Loreti. Return to forever” is being realized. This project is significant not only by concerts and creative meetings. They are: the Junior Vocal Arts Festival “SOLE MIO” under the patronage of R. Loreti, master classes for young talents, the opening of musical and vocal schools, including schools for children with disabilities. The long-awaited book-autobiography “Once it happened to me …” is being prepared for publication and presentation. In the project of Roberto Loreti in July 2012 the tour around the cities of the Southern Federal District will be held. – Offer of partnership in the field of publication and distribution of book. 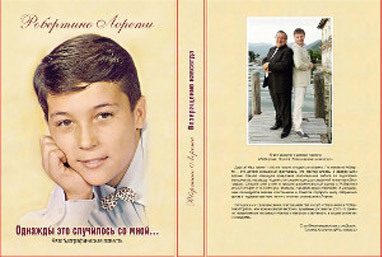 The presentation of the long-awaited book-autobiography “Once it happened to me …” in which the reader will be told one of the mysteries of the 20th century about the formation and life of the legend. “…. Poverty and the ascension to the “THRONE “, fanatical love of fans and intrigues, the glory and disappointment – it was all that I had to pass and did not keep me from remaining a man … “. The book is ready for the publication, the author finished it in January 2012. We have a contract for exclusives publication and distribution in Russia, CIS and all over the world. The circulation (the first) is 50 thousand copies. According to the book the script will be written and a feature film will be made. We offer participation in the publication with the corresponding advertising at the federal and regional levels.